You already know about the Cultural Revolution Penalty, but that wasn't the only special punishment that the LeMons Supreme Court cooked up for those Texas miscreants! Advances In 24 Hours Of LeMons Penal System Cruelty: The Cultural Revolution! When we fly to a distant state to keep the unruly racers in line, the first thing we ask ourselves is "What do they hate most in these parts?" Then we try to tailor some punishments that jab miscreants where it hurts, as part of our safety-enhancing LeMons Aversion Therapy Program. What do Houston racers hate the most? That's right- gun-confiscatin', gay-marryin', tax-raisin', socialized-medicine-supportin', union-lovin', EPA-fundin' commies! You Texas LeMons racers who got hosed by these extremely cruel punishments can thank your fellow racers who spent the six months prior to the race emailing endless right-wing screeds to members of the LeMons Supreme Court for providing the inspiration for this stuff; you know who you are! We started off with the Community Organizer penalty, in which we hand a stencil with the ACORN logo to the miscreants' team, who must then organize the community! That means they need to get five other teams to spray the logo on their car and sign off with their names and car number. Oh, they hated this one- it was like branding their very flesh with the symbol of everything they stand against. Much as the Community Organizer drove them nuts, they hated the ¡VENCEREMOS! penalty even more. We handed the miscreant a stencil with the image of Che Guevara and ordered him or her to put Che's iconic visage on every surface of the vehicle. A little explaining to do once the rest of the team sees that! We saved the ¡VENCEREMOS! for Mustang teams, as it seemed most appropriate for them. The Che-emblazoned cars looked really cool on the track. Well, we thought so. Speaking of revolutionaries, I neglected to show you the cover of the Little Red Books we used for the Cultural Revolution penalty. The Great Helmsman was most appreciative. We really went to town with the flag penalties this time; the Taiwanese National Anthem penalty was so much fun that we made more PVC flagpoles and bought more cheap flags. What flags do we fly on our cars in Socialist California? Why, Massachusetts, USSR, and UN flags, of course! Potential LeMons South Miscreants Beware: The Taiwanese National Anthem Penalty! Of those three choices, the Texans seemed to hate the Massachusetts flag the most; we thought of using a California flag, but Ronald Reagan, Richard Nixon, and George S. Patton all came from California and thus our own state flag wasn't socialist enough. Once again, we focused on the Mustangs for the most commie-inspired of our penalties. We planned to have miscreants fill out United Nations Tax Form 666 (which takes all the money the feds don't grab), but we never got around to creating the form. Next time, Texans! We also had some non-Texas-specific penalties, such as the LeMons Poster Puzzle. No team was able to finish the puzzle, due to the large areas of featureless red space in the image. The LeMons Trivia Contest was a lot of fun; we had a list of 20 LeMons trivia questions (e.g., "What kind of car won the first-ever 24 Hours Of LeMons race in 2006? "), and the miscreant had to get five correct before being allowed to return to the race. We'll be using this one again at Thunderhill, since it's such an audience-pleaser. 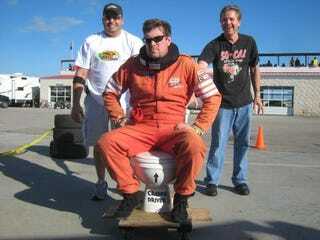 The Crappy Driver Penalty got a lot of attention from the onlookers; the miscreant had to sit on a wheeled toilet and be pushed around the paddock by his teammates. Assistant Judge Mason led the Crappy Drivers on their travels in his custom-built MG roadster. That thing sure beats the hell out of a Big Wheel! Chief Perp Jay Lamm thought up the LeMons Haiku, in which the miscreant must compose a haiku about his or her crime, then paint it on the car using a brush. We'll need to get some paint that sticks to oil-coated surfaces next time, because most LeMons cars sweat oil from every surface. How about this haiku, painted on the engine cover of an MR2? Long-time LeMons fans are familiar with the West Virginia Homesteader Penalty, in which the miscreant's team must put the race car up on jackstands, remove the wheels, set up folding chairs in front, and eat salty snacks. Because everything is bigger in Texas, we decided to establish an entire West Virginia trailer park, with a total of eight cars and nearly 100 salty-snack-eating team members. Instant party! Even the contending teams who were grinding their teeth over lost positions in the standings had to admit this one was fun. We put a new twist on the Preach To The Converted penalty for this race; instead of being forced to read Tom Cotter's ode to a barn-find Pinto, the miscreant had to read my novel to the audience. Fun for everyone! Datsun Z-driving LeMons Legend Troy already has a personalized penalty, but we thought we'd get him to help us punish other drivers, even when his team has committed no crime (such is the price of being a legend). The Talk To The Troy penalty, which evolved from Justice Lieberman's Talk To The Wall penalty (in which the miscreant must face a wall and explain why he didn't deserve his black flag), goes like this: the miscreant gets duct-taped to Troy and must discuss the pros and cons of various Nissan cylinder heads and/or distributors for 15 minutes. Lack of passionate opinions on the subject matter results in additional time added to the penalty. Thanks, Troy! Since our next race will be in California, behind the Socialist Iron Curtain, we'll need to devise some fiendish right-wing-themed penalties for miscreants that fall into our clutches. Perhaps we'll stuff them into the Conservative Talk Radio Echo Chamber (a refrigerator box equipped with multiple radios tuned to different conservative talk-radio shows), or make them recite Spiro Agnew's "Nattering Nabobs Of Negativism" speech through a bullhorn. Our advice? Drive clean!